Often dismissed as an artificial and expensive city-state Singapore makes for a great stop over on long journeys or shorter visits to Southeast Asia. Contrary to what most people think, there are lots of free things to do in Singapore. For such a small place, this 50-year old country has enough to keep you busy for a week. Don’t believe me? 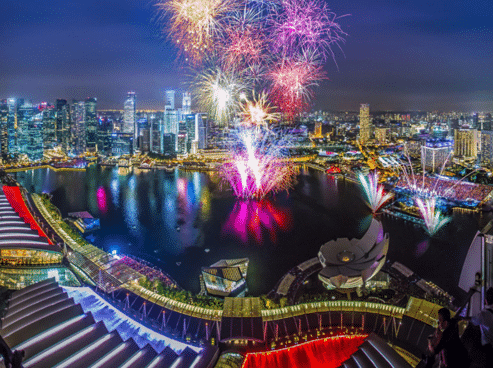 Check out the 50 things to do in Singapore. For a shorter visit, this guide is the perfect itinerary for 48h in Singapore, with emphasis on local food and experiences. Having lived in Singapore for 5 years what I love most about the city is the co-existence of so many cultures and traditions side by side. The island-state has over 5.5 million people of which about 60% are Singaporean residents, 10% foreign permanent residents and the rest expats. What is most interesting is that 75% of the population is of Chinese origin whereas 15% are Malay and 7% Indian. The remaining 3% are from various backgrounds, mostly Western or Asian. It is this melting pot of cultures that brings so much variety and richness to the experience. In Singapore, we celebrate all holidays, from Buddhist, Hindu, Malay, Muslim, Christian and Chinese origin. We will go away for Christmas and then come back to take a few days for Chinese New Year when the country is quietest. In March, Easter will give us another break followed by Vesak and Hari Raya. Before Christmas, the second Hari Raya and Diwali will come in. The city is also organized in various neighborhoods where ethnic groups prevail. Although local Chinese are spread across the city, Chinatown is the key expression of their culture. When Indian immigrants started arriving in Singapore, the British Government gathered them all in what today is known as Little India. Malays are mostly concentrated around the East Coast, in Katong and Gaylang. Expats may live anywhere, but some pockets in the city are more popular because foreigners don’t typically live in Government Housing but in condos which are located in certain areas. This variety of cultures means that, on a given day, just by jumping on a bus or taking the metro, you can be in several completely different countries. Care to follow along for 48 non-stop hours in multi-cultural Singapore? And if you’re looking for more things to do in Singapore, you’ll need to save this article with over 100 sites and activities. If you are flying from Europe chances are you will land around that time. If coming from Australia you may start the itinerary in the morning of Day 2 instead. Check in into your hotel and freshen up. Ready to go out. Little India truly feels like being in India minus the assault on the senses. As Wikitravel puts it, it is “a sanitized version of the real thing”. It is clean and safe but it will still be noisy and messy as much as any other city in India. Most Singaporeans from Tamil descend live there as a result of the British policy of ethnic segregation. Although the original settlement for Tamil immigrants was closer to the Raffles Hotel, that area is no longer a district and most Tamils now live in today’s Little India. Although the concentration of Tamil-descendants in Little India is large, there are also pockets of Chinese and Westerns living in the area. Here is my complete list of things to do in Little India Singapore. The best way to experience it is by walking around. Check out the stalls selling saris, spices, nuts and shiny gold bangles. You are sure to hear Bollywood songs blasting from some stereo system and will enjoy as much coziness and lack of personal space as in India, particularly on Sundays when the construction workers are off. For the most beautiful smell buy one of the jasmine garlands that are sold by the roadside stalls, they are not only pretty but they smell gorgeous. If you are close by, walk into one of Singapore’s institutions: Mustafa Centre, an incredibly large maze-like shopping centre where you can buy practically anything you can think off at amazing prices. It is mildly disorganized, stacked up to the ceiling with boxes and crowded with people looking for bargains or doing their daily shopping at almost any time of the day or night. Although it is more and more becoming a pilgrimage place for tourists, it still remains a local place for residents to look for good deals. watch out not to get lost. Stop by at Sri Veeramakaliamman Temple, a Hindu temple dedicated to the goddess Kali. Remember to take off your shoes. Lastly, for authentic Indian food go to The Arcade where locals shop for their groceries. One of the restaurants best known for its fish head curry eaten on banana leaves. It is a real experience, amazingly good South Indian food and a meal that will truly make you feel like in India. The incredible Avatar-ish Gardens by the Bay park is my favourite spot in Singapore. Super trees, a suspended bridge, the large orchid and tropical flower and plant greenhouse, it is all incredibly pleasant and a modern take on urban parks. It is a very large park with lots to see but, although most of its attractions are closed at night, I recommend going there after dark because it is less crowded and less hot. Also, as a bonus, the lights make it look like a fairy tale place. I love walking around wondering its trails and paths at night when the blue, purple and yellow lights illuminate the way. Take a walk after dinner to enjoy the best of it. Not as large as the Hong Kong lights show but a very popular event in Singapore the Lights and Water show is a 15minute show set in front of the Marina Bay Shoppes shopping mall by the water in the middle of the promenade. The show is projected on water steam for everyone to see. It is a story about life and in the 3 years I am in Singapore I have not seen them changing it. It is worth a visitStroll from Gardens by the Bay across the main highway to the Marina Bay Sands Hotel. Be sure to follow the signs and note it may take you up to 20min to find your way. Ce La Vie is a club, restaurant and bar on the top floor of the Marina Bay Sands Hotel just above the Sky Park Observatory deck. Instead of paying SGD20 to go up to the Observatory I would recommend having a drink at Ce La Vie after the how. Just walk into the Marina Bay Sands hotel and ask for directions. Ce La Vie is a posh bar so dress appropriately, no shorts, no flip flops. It is a fashionable spot also popular with tourists because it is a better alternative to the Sky park deck and it is truly magical to see the skyline from there, the Singapore wheel and the marina. Truly worth the expensive cocktail you will have to pay for! Unfortunately, seeing the pool on the roof of the Marina Bay Sands hotel is no longer an option unless you are a guest staying. It is a great spot and it has absolutely breathtaking views of Singapore’s skyline and sunset but it is off limits to most of us. Singaporeans like to eat kaya toast, soft boiled eggs and teh/kopih tarik for breakfast so, when in Rome…Teh tarik is a combination of not high grade tea and sweetened condensed milk. It is not for the faint of heart or for the diabetic. It has an acquired taste but I highly recommend trying the whole set even if simply to feel like a local. The drink is accompanied by a pair of soft boiled eggs served on a bowl which you can add spicy sauce to and then two toasts with kaya spread. Kaya is a spread made with coconut and pandan and it looks slightly green. The toasts sandwich a slice of cold butter in the middle along with the kaya spread. My suggestion? dip the kaya toast into the egg and if you are adventurous you can also add the chili oil and soy sauce the locals add to it, it’s too much for me in the morning! Ya Kun Kaya Toast is a stall started by a Chinese immigrant in the 1920s and has been in the same area between Lau pa Sat and Telok Ayer street since then. Its current location is on far east Square and throughout the day the store is always bustling with people overflowing into the street on small stools and tables. There are stalls in several other locations across the island but this is the original one. Pulau Ubin feels like any place but Singapore. Away from the glitzy sky scrappers and the urban landscape the island is remote, quiet and wild. Translating as granite island, the island used to supported a few thousand inhabitants in the granite mining industry. Today the quarries have been abandoned and remain as proof of Ubin’s history. The forests that were cleared to cultivate rubber, coffee or pineapple have now been recovered by mother Nature with overgrow. Life in the island is still as it used to be and a few kampongs, or villages, still exist to remind everyone of what Singapore looked like in the 60s: wells for water and generators for electricity. When you arrive on the island you will be able to rent a bike from a few of the houses that have been converted into bike rental stores. To get there head to Changi Village jetty and take a dumboat to Pulau Ubin. It should take 10 minutes and cost less than SGD10. You can also join one of the free guided walks conducted by volunteers. Wild Honey is a well known breakfast all day cafe in Singapore. I recommend it because it is a good example of what Singapore has to offer: a global cuisine and influence. They have all sorts of breakfast dishes showcasing the palate of every country in the world. You can sample a Spanish dish, a Mexican breakfast, the French equivalent, a British fry up, a Tunisian shakshuka or practically any other breakfast dish. After lunch, have a walk along Orchard Road, the fashion centre of Singapore. Store after store of high end brands. Walk into Takashimaya’s department store, Tangs or any of the international brands. Orchard road is packed in the weekends with people having a stroll, shopping, people watching or simply running heir errands. It is not that the road differs much from what you can find elsewhere but the melting pot of people is interesting, as is watching the world go by from one of the benches under the shade of a tree. Dempsey’s PS Cafe on Harding Road is the go-to place for expat families and couples. It is a cafe with several outlets across Singapore but the Dempsey one combines absolutely awesome signature cakes with greenery, glass walls floor to ceiling and the opportunity to walk around the Dempsey Hill area, a gem of antiques, restaurants and a few hidden gems. Make sure to check them out after the cake. Take a cab to Clarke Quay and marvel at the most touristy part of Singapore. Clarke Quay is a covered fake-looking area jam packed with restaurants, KT places, bars and all sorts of people from all ages. It is also a tourist’s paradise where the shinny lights, the crowds and the river provide the right setting for a mesmerizing back drop. From Clarke Quay you can take a cruise up and down the river. It provides a different view on the city and the opportunity to see much of the river facing buildings as well as the Marina Bay buildings, the sky scrappers and the heritage quays. Best is if you take it all the way down to the Marina, see the Merlion, the Business District, Boat Quay and Parliament building and then come back up for dinner. On your left side walking up the river is Jumbo Seafood. Chili crab is the most famous Singaporean dish and Jumbo is possible the best known place to have it. Nowadays it is not necessarily the best chili crab in town but what it lacks in homeyness it compensates with a great view (by the river), Chinese efficiency deserving of admiration (the team manning the tables, organizing the queue, taking orders, serving, etc.are quite incredible at churning customers) and character. You are best to book in advance because the queues are endless even with a booking. Head to Club Street to experience Singapore’s expat life. Club street is a heritage shop house lined-up small street which gathers most Westerners in the weekend. Since mid 2013 the government decided to close down the street to pedestrian traffic on Friday and Saturday night from 7pm and the restaurants and bars have since taken over the pavement with chairs and tables. The streets fills with expats of all sorts enjoying a drink with friends, having food and chilling. You can have degustation style fusion food at Lolla, Japanese at glitzy Izy, Italian at Da Paolo, Cucina or Spizza, French at Beaujolais, Asian at Ding Dong or international at Oxwell’s. After food, head to one of the rooftop terraces either at Screening Room or Scarlet Hotel, the first and one of the best boutique hotels in Singapore. You deserve a later morning today! On the last day visit the Chinese part of town. Start with “Yum Cha” or dim sum with tea at Yum Cha Chinatown on 20 Tengganu Street. Dim Sum is a range of small plates made for sharing containing 2-4 pieces of the chosen type. Food can be steamed or fried and may contain sweet or savoury items. Tea is the drink of choice. Don’t miss the dim sum filled with broth, yum! You will be provided a menu to mark your order quantities, a small bowl to eat your food with and a pair of chopsticks. Usually, napkins are not provided and instead people use wet towels and when they are done they wash their hands with soap. It is customary to serve tea to others before you serve it to yourself. There is also a lady pushing a cart around from where you can point at the items you want. After breakfast, there are three main sights in Chinatown you don’t want to miss before heading back to the hotel to pack and go. But here is a more extensive list of the best attractions in Singapore Chinatown. The Buddha Tooth Relic Museum and interesting temple and museum that is also very pretty and colourful from the outside. 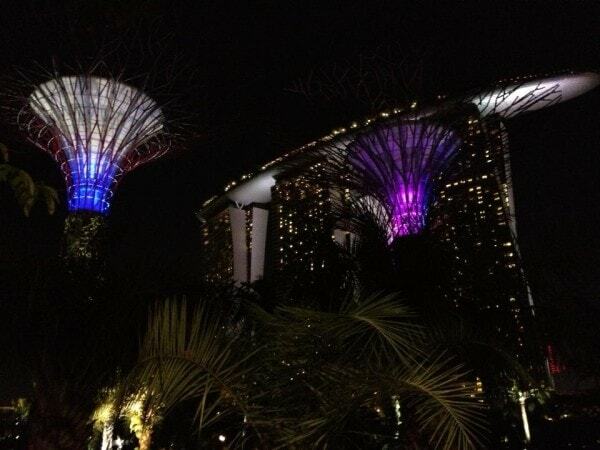 Have you been to Singapore on a short stay? What else would you add to the list for a short 48h stop-over?